A few days ago a friend asked my thoughts on the hukou system and how it works in modern day China. I realised I’d never written about it here on the blog – it came up once, in a conversation with a taxi driver I recounted, but I didn’t stop to explain it. What foreigners call the hukou system is technically called the hu ji (户籍); the word hu kou (户口) refers to an individual’s registration papers (or the family registers of the past). The hukou records information including ID number, height, blood type, education level, current and previous address, and employment. A hukou is required for many official transactions, such as employment, travel, marriage, and even opening a utility or a mobile phone account. I’ve heard that there are also hukou “files” kept by police on each individual, listing all kinds of information about an individual accumulated over the years. The hukou system has its roots in an ancient system of household registration. Registers of families kept by Chinese governments dating back to 1000 BC and beyond were used for taxation and conscription. (You may remember an early scene in the the Disney movie Mulan where a government official comes around and, armed with a register of households, conscripts a soldier from each.) By about 700 these registers were being used to monitor migration, and apply different taxation/conscription policies to different areas. Governing officials began to restrict immigration between different areas. The modern hukou system started in 1958, with the Communist Party using it to control migration between rural and urban areas. Each individual was registered in their home location, which was classed as either rural or urban; movement from one place to another was tightly controlled. This kept a constant number of people in agricultural work, but it meant people registered as rural had limited opportunities to seek work in any other industry. Anyone who worked outside their “legitimate” place did not qualify for Party provided benefits, such as food rations, housing and medical care. Economic reforms in the 1980s led to hundreds of millions of rural-registered Chinese losing their guaranteed jobs and benefits in State Owned Enterprises (SOEs – government owned businesses). Many moved to cities where factories set up outside the main urban areas offered work – but living outside their registered area meant these workers were in effect illegal immigrants. They could not access the services of regular citizens, because they weren’t supposed to be in the city in the first place. Factory owners and managers could house workers in sub-standard conditions – because as “illegal immigrants” they had no recourse. For decades, police had the power to “deport” people found to be living and working outside their hukou location. (Big changes to these powers were made in 2003 following the media-decried death of a migrant worker who was detained and beaten by police after being found working outside his registered location). In the 1990s the government introduced “temporary urban residence permits” which rural residents could buy – enabling them to legally live and work in urban areas. There are still restrictions, though; a rural-registered person may be prevented from buying property, or licensing a car, in the city in which they legally live and work. All this means that the children of migrant workers usually live with grandparents in their parents’ home town. If they live with their parents in the city, they are excluded from public services such as education and health care. About 500,000 migrant children live in Beijing. These families cannot afford public school fees (or are barred from enrolling without city work documentation) so most migrant children attend private “migrant schools”. In the past, government officials would close these schools down – reasoning that if services were unavailable, these “illegal immigrants” would return home to the countryside. 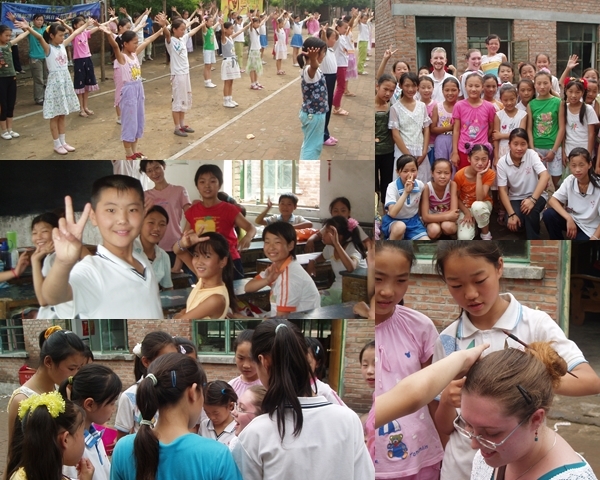 Visiting a migrant school summer camp (and having my hair done by a group of excited girls!) in 2006. INCLUDED is an NGO started in Beijing that works with migrant communities; if you’re interested in learning more about the migrant worker situation here and elsewhere, I recommend visiting their website. I actually helped procure some of the initial funding when it began as Compassion for Migrant Children in 2006 and I’m amazed at how much they’ve done in the past 8 years! There are currently three ways to qualify to change your hukou – university education, military service, and joining the Communist Party (which is invite-only) but there are annual quota restrictions for the number of hukou transfers. While each Chinese person is registered to a specific location, the one factor that matters most is whether that location is classed as rural or urban. Some government mandated employment benefits, however, are location specific. When I worked in Langfang, the company paid required contributions to government social schemes including a pharmaceutical benefit – this put money onto a pharmacy debit card used to buy medicine. A co-worker friend from another province used to buy me ibuprofen, vitamins and whatever else I might use with her card – it was linked to our city, so she couldn’t use it anywhere else. The mandated amount was more than she as a single person could possibly use, but when she moved on to a new location she wouldn’t be able to access it anymore. In 2008 dozens of Chinese intellectuals wrote open letters to the government calling for the present hukou system (differentiating between rural and urban) to be abolished. There have been government rumblings about changes to the system, such as possibly permitting a transfer from rural to urban, and pledges to educate migrant children in Beijing. Last year  Premier Wen Jiabao spoke about increasing reforms to the system; in December an announcement was made that the hukou system will start to be dismantled. Restrictions will be lifted in towns and small cities, and later in medium-size cities, although large cities such as Beijing will still have restrictions (ostensibly to prevent a mass migration that would cause a drain on social services). The hukou system pops up in my own experience of China in several ways. Firstly, most of the house keepers I’ve met who had young children (including a few I hired myself) lived apart from them, seeing them only once or twice a year. But there are more opportunities to work and make money in the city, so not only do they continue to stay away from home, they help friends from home find work in the city as well. A full time housekeeper/nanny in our area makes about $500 a month, at least twice what they could hope to make at home – and most can find extra hours on top of that if they want to. My current housekeeper cleans a few hours for me during her “free time” from work at her live-in cleaner/nanny position. Actually, she asked for a day off last week which meant she could take a little extra time away during the Labour Day holiday and go home to see her young son (I’m guessing the family she works for went away and she was therefore free to be gone while they were). It will be interesting to see what results from the government’s planned changes to the system. Their goal seems to be to develop smaller urban areas, create jobs and industry there. While that would be good, I still don’t think it will make a big difference to the situation in a place like Beijing. So much of the work done by migrant workers could or would not be done by the legal residents alone – and as long as there is demand, there will be a continual supply of immigrants to do the work. This is probably one of the most well-written essays on the subject that I’ve come across. Thank you for raising awareness. Most people in countries where systems like this do not exist, take domestic freedom of movement for granted as a right and not a privilege, and like the Chinese who assume that the whole world has a similar hukou model, most people never even comprehend the possibility that things could be a different way. It would be seen an outrageous violation of one’s rights as a citizen. I was born in Beijing, to parents who were born in Beijing. I left at a very young age, but the attitudes about “countrysiders” were routine dinner table discussion for many years afterwards. And that extreme display of prejudice made absolutely no sense to me. It wasn’t just classism, it was something more, and I never figured out what it was. What did it look like? It looked just like the attitudes that people who were born and raised in whatever country I was in at the time, had towards foreign nationals who had “illegally immigrated”. I remember clearly the day I started reading about hukou policy and exactly what its repercussions were. Growing up, I thought that “hukou” just meant “identification”. It was kind of like a driver’s license – something you use as ID when you access services and buy alcohol. When I realized what it actually was, it was like decades of confusion and missing puzzle pieces all came together at once. When I got up off my chair to continue with my day, I was not the same person anymore. I hope that, when westerners learning about the hukou system get confused and react with “this is strange/absurd/injust/etc”, it also challenges them to re-examine how movement is controlled between nation-states, and perhaps even to see glimpses of what that truly is – an artificial system designed for the purpose of maintaining global inequality. Thanks for your insightful comments, it is really interesting to hear your perspective of hukou. When I started thinking of the temporary residence permits as effectively work visas it gave me a whole new sense of the system. On the surface it seemed fair, a similar system to me procuring a work visa – but these aren’t foriegners. They are people restricted from moving within their OWN country. Yes, for me it is a privilege to live in Beijing, not a right – but it is also a right that many Chinese do not have.